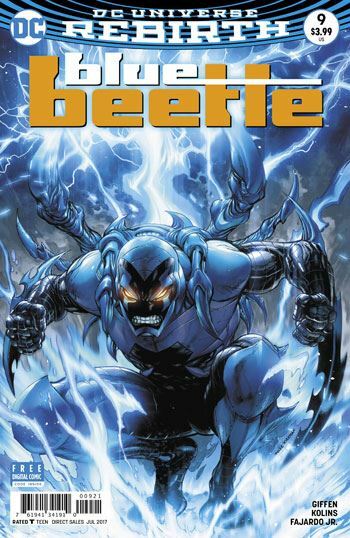 Overall I quite enjoyed Blue Beetle 9. The story continues to build towards the climax, as Ted Kord and Jaime Reyes recruit OMAC to help them against Arion, the now genocidal former lord of Atlantis, while Teri speeds off with the helmet of Nabu, hoping to reunite it with Kent Nelson and revive Dr. Fate. As always, Giffen and DeMatteis display their signature gift for banter, and the dialogue throughout is fresh and fun. Scott Kolins’ art is very strong as well, and I really loved the pages that dealt with Dr. Fate and his tower. The only place this sort of mildly went wrong for me was with OMAC. There is some excellent tension in his part of the story, as Jaime and Ted unwittingly attract the attention of Brother Eye. Between Brother Eye and Arion the heroes are caught between two powerful forces that are more than willing to wipe out everyone on Earth to achieve their ends. The two Blue Beetles have to convince Brother Eye to allow OMAC to aid them, rather than having the One Man Army Corps just kill them. As one might expect from Giffen, the higher the tension, the more likely it is to br broken with a one liner. Sure enough, that happens. And that is, for me, where the problem lies. Really? Is there one single person out there who would read that line and not hear “I am Groot.”? Even the way Jaime and Ted respond to the repetition of “I am OMAC” feels like it was cobbled from Guardians of the Galaxy. There is an awful lot to enjoy in this book. Giffen, DeMatteis and Kolins have spun this first story arc into some magnificently designed chaos. It’s such a shame to mar that with such a cheap rip-off laugh.